Update: Today, Mohammed Morsi was officially sworn in as Egypt's new president. Already yesterday he swore a symbolic oath of office in front of hundreds of thousands in Cairo's Tahrir Square, which is, as he said "the symbol for freedom, dignity and change". Egypt has a president again. Finally, with 3 days of delay, the Presidential Elections Commission announced the result of the presidential election live on television this afternoon: With 51,73 per cent of votes Mohamed Morsi is the winner of the presidential runoff. Ahmed Shafiq took 48,27 per cent. The turnout was 51 per cent. Mohamed Morsy will be Egypt's first civilian president since the foundation of the modern republic on 18 June 1953. He will take office on 1 July 2012. 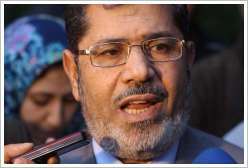 Morsi (born in 1951) has been chairman of the moderately Islamic Freedom & Justice Party since April 2011. He received his Bachelor's and Master's Degree in engineering from Cairo University and his PhD in engineering from the University of Southern California in the U.S. in 1982. He was an Assistant Professor at three universities. In 1985, he returned to Egypt to teach at Zagazig University. Two of his five children were born in California and are U.S. citizens by birth. In 2006 he was sentenced to 7 months imprisonment because he supported a group of judges who protested against the massive vote-rigging during the presidential polls in 2005. To build up a democratic, civil and modern state Morsi promised to distribute his presidential power to numerous vice-presidents and aides and even appoint a woman as one of the vice-presidents. Addendum (26/06/12): Shafiq, Morsi's opponent and Mubarak's last prime minister, has left the country just hours after the prosecutor general opened an investigation into allegations that he wasted public funds during his eight-year-term as a civil aviation minister under Mubarak. On Wednesday morning, 6th of June 2012, at sunrise we can witness a special astronomical event which will be visible next time after 113 years (unless you will travel to the reverse side of the globe - then you have to wait "only" 105 years): Venus, which is more than 43 million kilometres away from us, will appear as a tiny dark disk moving across the face of the Sun. At 4:57am the Sun will rise in Luxor. 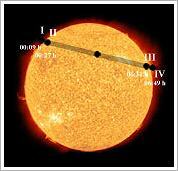 However, we will just be able to watch the transit from the 3rd contact (III) on when Venus touches the inner edge of the Sun until it moves out of it, that will be from 6:38 to 6:55 am. 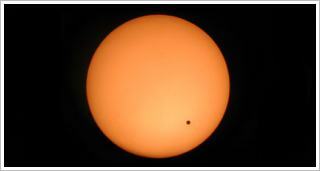 Thereby, the black-drop effect will be visible: a small black "teardrop" seems to connect Venus and Sun. But note: Never view the Sun directly without a safe solar filter. Looking at the Sun with the naked eye or through a camera can permanently damage the retina! 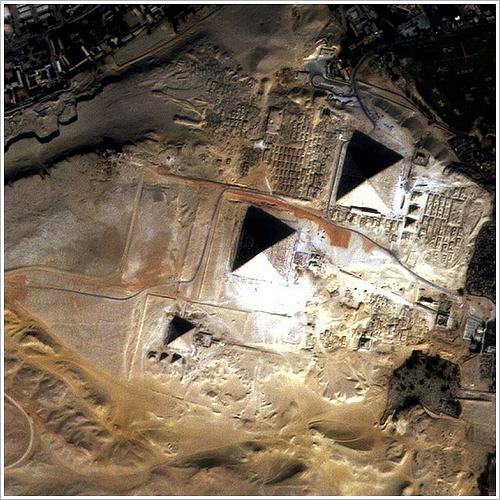 The Emirates Institution for Advanced Science and Technology (EIAST) wanted to capture an iconic image of Egypt and chose to image The Great Pyramids "as they represent Egypt’s prominent role in history". The image was captured by DubaiSat-1 in its orbit 680 kilometers above the earth’s surface and made as a present to the Egyptian people accompanied by the best wishes for the future. It can be used for scientific or humanitarian purposes. 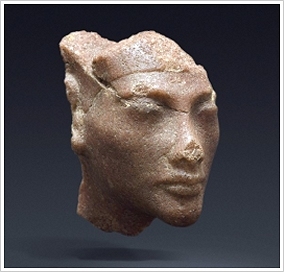 The quarzite head which was wrongly regarded as depiction of Pharao Akhenaten for decades measures just 5.5 cm in height. Now, a German egyptologist identified it as a Nefertiti portrait. 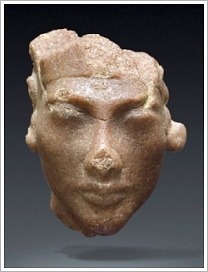 For one thing the material is an indication - according to Christian E. Loeben from the Museum August Kestner at Hannover only women's portraits were done in quartzite at the time of Pharaoh Akhenaten - , for another thing visible remains of a certain crown at the ear point to that fact. Usually, the small masterpiece is kept in a private collection in Europe but it will be on show in a special exhibition in Brussels entitled Ancient Egypt: Masterpieces from Collectors and Collections (June 6th to 10th, 2012). 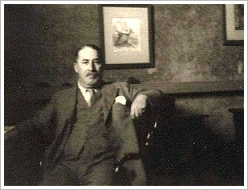 On 12 June 2012 the British auctioneers Bonhams will sell in London the remaining papers of Howard Carter, retained by the Carter family. The lot (no. 39) comprises autograph drafts of his account of the discovery of the tomb of Tutankhamun, lecture notes on the discovery, correspondence, photographs, equipment used by him as an archaeologist, 2 thermos flasks, and material relating to his own death and funerary rites. 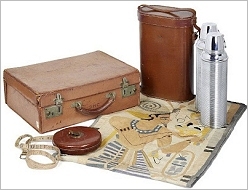 The vast collection will go to auction with an estimate of 120,000 - 190,000 EUR. Followup on 12/06/12: The lot has been sold for 135,448 EUR. Today, 10:21 am resp. 10:23 am a Cairo court sentenced toppled president Hosni Mubarak and his interior minister Habib El-Adly for their role in the killing of more than 850 protesters during last year's revolution to life in prison. 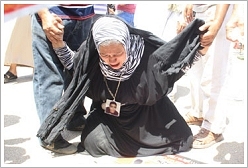 Mubarak's two sons - Gamal and Alaa - and six of Adly's security officials ( deputies) were acquitted. 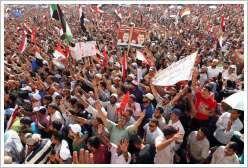 The sentencing was aired in Egyptian State Television. 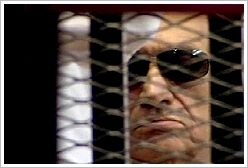 It was the first time an Arab leader ousted by his people has been placed before a regular court. While the prosecutor general demanded the death sentence for Mubarak, his lead defense lawyer said he will appeal the verdict and take it to the Court of Cassation - he is very confident to win. After the sentencing Mubarak who has been held in a presidential suite in a military hospital for the last months was transferred to the maximum security Tora prison complex. Deir el-Barshā (also Dair al-Berscha, Deir el-Bersche or Dayr al-Barsha) is situated in Middle Egypt close to Minya on the east bank of the Nile. 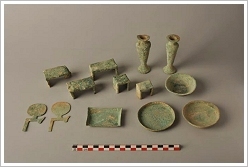 During its 2012 spring campaign archaeologists of the Katholieke Universiteit Leuven reportedly discovered an important burial dating back to the beginning of the Middle Kingdom (approx. 2040 BC). 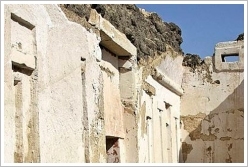 The tomb has been investigated already in 1891-1892 and excavated in 1915, but the excavation was stopped. Because the burial has been robbed at least twice and has suffered extensive damage, there was just a rare chance to make important finds. 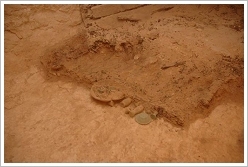 However, there in the unexcavated southwestern burial shaft the Belgian mission found a sarcophagus inscribed with ancient funeral texts as well as a large amount of ritual objects in alabaster, faience, copper and pottery - still in their original position, embedded in dried lime crusts which developed after heavy rains. 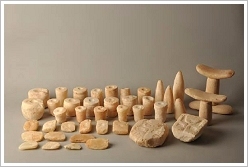 Finds dating back to that early time are very rare and therefore very important. Some of the found ritual objects are unique and were only known from ancient depictions. Unfortunately, the sarcophagus is in a very bad condition and needs a fundamental conservation. It belonged to Djehutinakht, the last nomarch of the First Intermediate Period and father of the actual tomb owner Ahanakht I., who was the first nomarch of the Middle Kingdom. The inscriptions of the sarcophagus, so called Coffin Texts, constitute the most important collection of religious texts of the Middle Kingdom and form the link between the royal Pyramid Texts of the Old Kingdom and the famous Book of the Dead of the New Kingdom. The badly preserved coffin of Djehutinakht may be the earliest representative of the Middle Kingdom.